Breathing Buildings discuss the updated 2018 edition of the regulations governing ventilation in schools. Buildings designed to comply with the 2006 edition of BB101 may use openable windows as the sole source of ventilation, or they may additionally use passive roof terminals or high level windows to encourage upward displacement ventilation. This concept has resulted in energy bills being significantly higher for naturally ventilated classrooms than was modelled, expected and budgeted for. This concept relies on incoming air being pre-heated by a radiator to above 16 degrees before being heated again by the heat loads generated by the occupants and equipment in the space. The net result of the additional heat imparted to the air is that flow rates are often increased to alleviate an overheating problem, thereby leading to very high heating bills. The 2018 edition of BB101 addresses this problem by encouraging the use of mixing ventilation – mixing cold fresh air with the warm air in the classroom. In this scenario, the exhaust temperature should be little higher than the heating set point in winter. 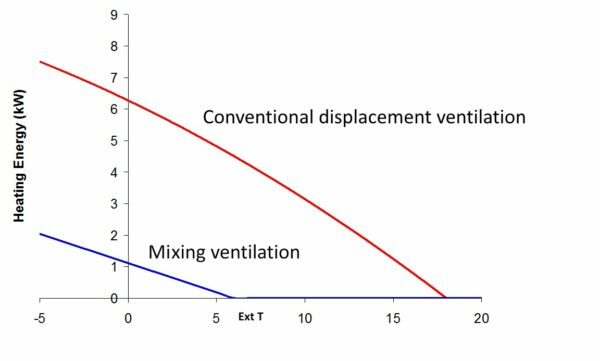 By utilising internal heat gains via mixing ventilation, space heating in a typical teaching space is only required when the external temperature is below 6 degrees, whereas a conventional displacement ventilation system in a classroom would still require heat input when the external temperature was 16 degrees. The internal heat gains in a classroom are significant; BB101 2018 states “Allowance should be made for the metabolic and equipment heat gains when the school is occupied to prevent over-sizing” It may be a leap of faith for designers to accept that internal gains can be used as part of the heat loss calculations, but it is a tried and tested concept, and this was recognised in the BB101 consultation document “The heating system and heat emitters should be sized to provide heat for the incoming outdoor air based on a lower ventilation rate during start- up” When the classroom is unoccupied first thing in the morning, the CO2 levels are low, so ventilation is not required and the heating system only needs deal with the fabric loss. A well-designed mixing system which responds to CO2 and temperature levels in a room works well because the increase in ventilation requirement based on CO2 is correlated with an increase in internal gain (the heat emitted from people). It is stated in the BB101 2018 “it is economic and practical to use demand controlled mechanical/fan-assisted systems for mid-season and wintertime” Buildings designed to the BB101 2006 are often stuffy, as cold draughty conditions “frequently prevents windows from being opened in densely occupied classroom spaces with low-level air inlets” The EFA have therefore defined what a cold draught is, and stated that it should be avoided. “The design of ventilation and its control should provide mixing of ventilation air with room air to avoid cold draughts in the occupied zone” The use of mechanical cooling in schools is to be discouraged in BB101 2016 “All occupied spaces should be provided with ventilation for warmer weather, preferably by using cross flow natural ventilation or ventilation systems with equivalent ventilation effectiveness and night cooling. 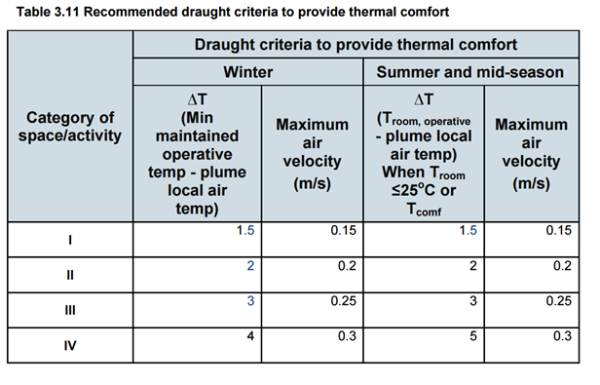 This will minimise ventilation opening sizes and eliminate the need for mechanical cooling” “Where the designer decides to use mechanical cooling, for example at times of peak summertime temperatures in areas of particularly high equipment heat load, this should be justified on heat load and energy efficiency grounds. It should not be necessary to use mechanical cooling in general teaching spaces with equipment gains of less than 15W/m² or practical spaces where the equipment gains are less than 25W/m², as practical spaces are larger and have a lower occupancy gain per 71 square metre than general teaching spaces. Some practical spaces have high heat loads, e.g. chemistry due to Bunsen burners; and graphics studios and music studios, which have large numbers of high-end computers” If mechanical ventilation is being used, then a daily average CO2 level of 1000ppm (~8l/s/p) should be achieved with a maximum excursion beyond 1500ppm for no more than 20 consecutive minutes each day. If natural ventilation is being used then a daily average CO2 level of 1500ppm (~5l/s/p) should be achieved with a maximum excursion beyond 2000ppm for no more than 20 consecutive minutes each day; this is significantly more stringent than in BB101 2006 which allowed excursions to 5000ppm. This change is a testament to the advancements in natural ventilation technology in the past 10 years. 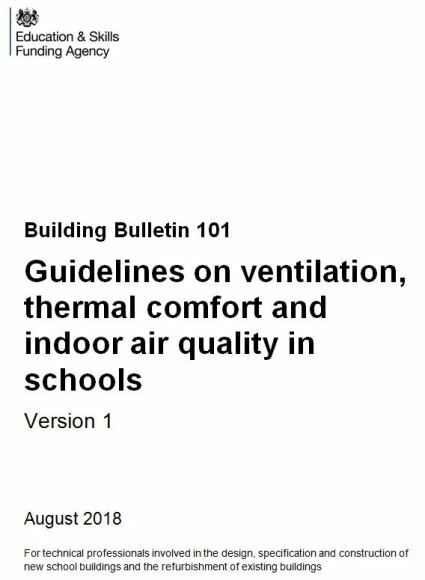 The 2018 edition of BB101 provides in-depth guidance on the factors that affect the indoor environment of schools, setting out the regulatory framework for ventilation in schools and gives recommended performance levels for compliance with UK regulations. To receive updates on changes in ventilation regulations, including an update to AM10 Natural Ventilation in Non-Domestic Buildings, follow us on LinkedIn and Twitter, or Contact Us in our Cambridge office. To receive updates on changes in ventilation regulations, including an update to AM10 Natural Ventilation in Non-Domestic Buildings, follow us on LinkedIn and Twitter, or Contact Us in our Cambridge office.